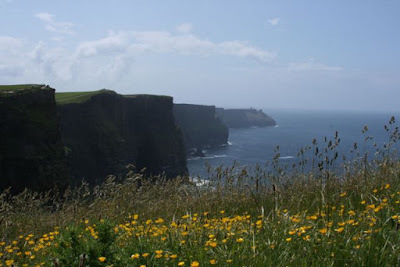 In Ireland, mention “the Cliffs” and faces light up with a spark of knowing pride. 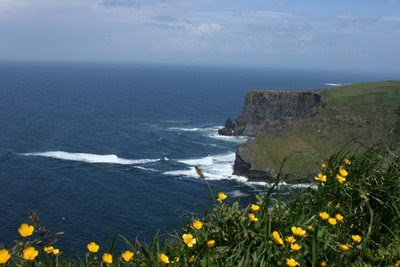 Everyone knows that “the Cliffs” are the Cliffs of Moher, one of the most beautiful spots in Ireland. 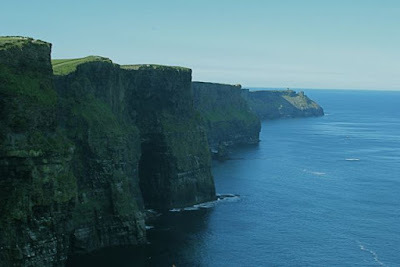 Rising more than 200 meters above the Atlantic Ocean and stretching for more than 8 km along Ireland’s western coast, the Cliffs of Moher offer a spectacular glimpse of Europe’s western-most point. With the waves crashing below, birds soaring overhead, and a sheer plunge at your feet, the natural drama needs little explication. The Cliffs draw thousands of tourists each year, and a few years ago a visitor’s center was built to handle the traffic. 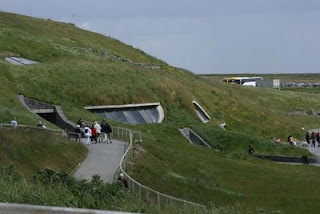 Set into the hillside, it is easy to miss the building itself, but within there is a gift shop, a coffee shop, a restaurant, plenty of restrooms, and the Atlantic Edge, an interactive exhibit about the geological and biological features of the Cliffs (for an additional charge). And on a hot day, I highly recommend the soft-serve ice cream cones from the coffee shop. Yummy! Who will love it? Everyone! The Cliffs themselves are gorgeous, and on a fine day, there is nothing better to do in Ireland. The walking paths are nicely-groomed, and those with mobility limitations have access to significant parts of the walking paths. Arrangements: In miserable weather (rain, fog, etc) the Cliffs aren’t much fun. They can be socked in with fog, limiting or even eliminating visibility. I highly recommend calling the visitor’s center ahead of your arrival to check the weather conditions. Notes: the visitor’s center is well-equipped with options for food, gifts, and clean restrooms. The Cliffs open to visitors at 9 am all year, but closing time varies depending on the season. Check the website for more information. In addition to visiting the Cliffs on your own, scuba, horseback, boating, and hiking outfitters offer trips to the Cliffs as well for a range of different vantage points on one of Ireland’s greatest landmarks. Love the cliffs! Been there many times myself, and am still amazed by their beauty. Really like the shot with the flowers in the foreground. Looks like a great place to spend some serious photo time. There's something wild but relaxing about being on the clifs above the sea. I love Cornwall for the same reason. I get the weather question a lot, and here's the thing about Irish weather: it changes. In some ways it reminds me of Hawaii -- a little rain, a little fog, some sun, maybe some wind -- all in the same day. 1. (with friend) Gorgeous, warm and sunny. 2. (with group) So foggy you could hardly see your hand in front of your face -- so we drove off to explore the Burren instead where it was sunny and gorgeous. 3. (with group) Returned 2 days later to gorgeous, clear skies and a cold wind off the coast. ohmygod! I was there 18 years ago. This totally brought back memories. Only we saw about 2 meters in front of us, but the trip was still amazing!